Death: when we hear this word, very cold and keen wind starts to blow on your face and slowly walk to your throat, vessels and finally to your heart, making us taste fear. Death is very abnormal, however, very normal. People can die of sickness, war, hunger or cold. People even die of happiness. It has been more than 80 years Palestinians are dying day by day, piece by piece, drop by drop due to the world's negligence. In this article, I will try to convey something of my experience after participating in the ICM program from a student's point of view. I do this by reflecting on my own experiences as an ICM Erasmus+ student in Birzeit University, Palestine. Erasmus+ is a turning point in my life. It has contributed positively in building my vision about the world, and opened my eyes wide to discover another world embedded on the earth we live on; a world that is more difficult and full of contradictions: a world that is called Palestine. 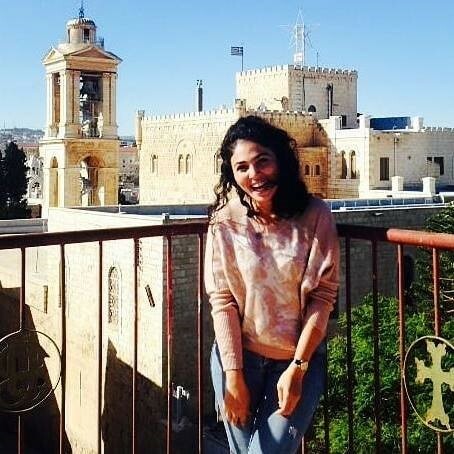 My name is Nargiz Mammadova from Azerbaijan; I am a master student in Siena University in Italy, enrolled in the Public and Cultural Diplomacy program. This semester, I got a chance to be an exchange student in Palestine. I consider myself very lucky to have been able to be part of this huge Erasmus family and to spend 3 months at Birzeit University in Palestine. The opportunity to study in a Palestinian University, which is part way through my degree course, was made possible by Erasmus ICM program. I am very thankful to the European Union, which created this kind of chance to me and to other students as well to see and experience different cultures. Student Nargiz visiting Bethlehem city, Palestine 2018. The overall experience was very positive with the help and concern of the staff in both departments. At the same time, not all my experiences as a foreign student were happy ones. During the visa procedure, I faced many problems, I wrote plenty of emails to the Israeli Embassy to get a student visa, but at the end they told me that they will not give a visa to me since I am going to an “Arab” University and they do not recognize this university. In spite of all difficulties, I am very lucky that in this period, my Erasmus+ coordinator professor Gabriel Usberti, and Siena University administration tried to help me a lot through writing letters and emails to the Israeli Embassy. When I entered Palestine, I realized that I am in a special place. I saw separation walls, I witnessed war, and I smelled death! To see history being written in front of my eyes and to be standing in the hottest conflict zone are not the reasons that made Palestine so special to me. Of course, those are not the reasons that made me adore the culture and how this place can connect three different religions. I can literally say that Palestine is the airport of Gods and hugs many cultures. I adored How people are hospital and good, and of course have a very rich cuisine. Love made me love Palestine. When I reached to Birzeit University, I was very late to start my mobility because of the visa issue however, Birzeit University administration understood me, and became very cooperative in my case. Despite of I was very late, they enrolled me to university thus I am very thankful to Birzeit University administration. The Experience of doing research in a Palestinian University gave me valuable insights into the diverse political sciences and gave me different perspectives to understand conflicts in the Middle East. Living in Palestine, I enjoyed meeting up with foreigners as well as students already there and with the Palestinian people! Understanding Palestinian culture was particularly interesting and it was great talking to locals to get insight into how they live. Working a part-time job was definitely a good idea to get integrated into the community.